How to get a Gig Featured on Fourerr? So you’ve created a gig and made a few sales…but how do you get more? Well, the simple answer is: Get your gig noticed on Fourerr by upgrading to a “Featured” gig! It’s really easy and getting your gig featured could results in multiple sales. What is a Featured Gig? How do I make my gig a “Featured” gig? All you need to do is hover your mouse over the “Seller” tab at the top of the Home page. Next, you need to select “My Gigs”. This will take you to your page of gigs (you may only have one active gig). Choose the gig that you want to feature; your gig status will be in green and will say: “Status: Approved and Active”. You need to then click on the orange writing next to it that says “Feature”. You will then be taken through to a page where you can either arrange payment via PayPal or AlertPay. How much does it cost to get a Featured gig? It only costs $5 to get your gig featured for 30 days. Why should I get a Featured gig? Once you have been on the site for a while, gigs tend to get buried unless they are extremely popular or highly rated. If you have had success with a few gigs before, and want to increase your sales even further, upgrading your gig to a “Featured” status is the best way to get noticed on Fourerr. A gig with a “Featured” overlay stands out from the crowd and also is one of the first gigs that people will see when they visit the site. This means more views, and can ultimately more sales and more money for you! Featuring your gig not only is beneficial in terms of promoting your services, but it is also a great way of showing to the rest of the Fourerr community that you are a serious and dedicated seller. It shows that you have confidence in the quality of your gig and that you are happy to share your expertise with everyone. 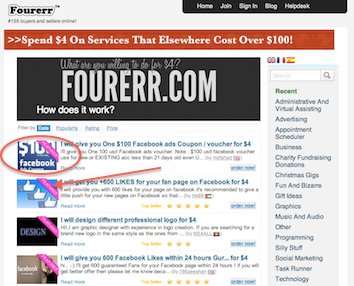 At only $5 for a whole 30 days at the top of Fourerr’s listings, it is a very good investment. It works out at only 16 cents a day – and if it means that you will get dozens of extra orders, it will be well worth it! 3 Comments on How to get a Gig Featured on Fourerr? Sir can I use my balance to use “Featured”? Contact out helpdesk and I’m sure we can work something to make your gig featured with your Fourerr account balance. Thanks to the author for explaining about the feature techniques and its benefits.